Central Otago is the source of full bodied, impenetrable Pinot Noir. The historical Shanagolden Block was settled in 1867 by James Leslie, a Scot who emigrated to New Zealand at the age of seventeen to prospect the Dunstan gold rush. 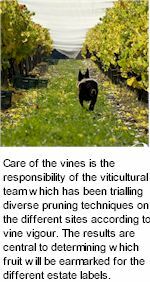 It later came to the attention of the proprietor, that the free draining, northerly aspect of this Block was particularly suited to viticulture. Just 1½ kilometres west of Shanagolden, grown to the nearby Old Matagouri Block, a small parcel of vines is the source fruit for the breathtaking Waitiri Creek Pinot Noir. The Waitiri vineyards are between 300 and 350 metres above sea level. With the growing degree days that the Gibbston area receives each year and the climatic challenges, the philosophy has always been to focus on delivering the best quality fruit, no matter what the weather. The hand picked grapes are destemmed but not crushed, treated to a five day cold soak for the extraction of colour and flavour prior to vinification. After seven days of fermentation the wine is left on skins for a another week until optimum tannin integration is achieved. Waitiri is then gently pressed off skins and drained to a mix of new and used 228 litre French oak barrels for malolactic and ten months maturation before assemblage and light filtration. Bright garnet hue. The nose displays complex notes of stewed cherries, cedar and mushroom, a perfume of violets and rose petal. The fruit driven palate offers flavours of wild raspberry with hints of cinnamon, red cherries and succulent plum. On the finish comes a note of mushrooma and thyme. The silky tannins are woven seamlessly into a structure balanced by savoury French oak and alcohol.